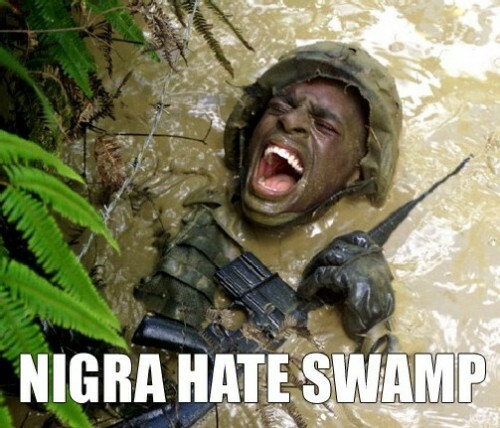 nigra’s can’t swim. And that’s a FACT! Your barrel is underwater sir, in a swamp no less. Poor Form. @natedog: Ahahaha. You made my morning. if I didn’t know any better I’d say thats the Quigley! @ aharrigan: if it is the Quigley, getting your barrel under water is only a matter of time, to which the Sgt’s will then chew you out with extreme prejudice. He’s just mad ’cause he couldn’t find the internet there. @natedog: If he has water or other obstructions in the barrel itself no amount of slapping and pulling will help that. SPORTS is used to clear a misfired round and ready another. Aaarrrg… A crawfish dun bit meh!! @Phyreblade: That was no crawfish, that was a shrimp…no a mantis shrimp…NO! OMG it’s flying mantis shrimp! Run for your life! RUN NOW DAMNIT! @nyokki: FLYING MATIS SHRIMP!? IN MY SWAMP!?!? NO WAI!!!! Hell you think He is hating the swamp? What about his buddy whose shoulders he is standing on? @SumoSnipe: Wat? there’s anuthah nigra under dat dere swamp? For cryin’ out loud, it’s a swamp not a clown car…! @Phyreblade: You never know, there may be a clown car under the water also. There could be several nigras or even hundreds of Mexicans. @Phyreblade: The world record for number of Mexicans to fit into a clown car is 328.